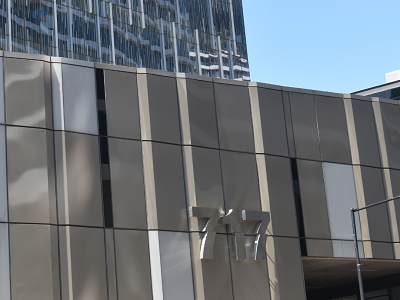 HVG Facades supplied their MondoClad solid aluminium panels for the recladding project at 717 Bourke Street in Docklands, VIC. By providing the builder, GDP Group a non-combustible compliant cladding panel, HVG Facades ensured a future proof solution for the office tower. Constructed from marine grade aluminium, MondoClad is a premium solid aluminium panel that perfectly meets the requirements of remedial works on buildings. Combining exceptional quality with superior fire performance, the non-combustible aluminium cladding panels are certified to AS1530.1. MondoClad, therefore, provides a definitive, fire resistant cladding solution for compliance and safety with no uncertainties. MondoClad solid aluminium cladding is available in a wide range of finishes and sizes to meet diverse design requirements. For the Docklands office tower project, HVG Facades supplied 900 square metres of 3mm MondoClad solid aluminium panels in a custom Bronze Metallic colour. The installation was managed by Total Cladding. Façade cladding is a contentious subject in the current building market, with fire incidents turning the spotlight on non-compliant cladding materials. New regulations require non-compliant materials to be removed and replaced with non-combustible façade materials that have passed the Australian Standard AS1530.1. Compliance and insurance are the most common drivers for recladding. MondoClad, Zintl and Swisspearl by HVG Facades offer a streamlined compliant remedy for recladding projects, which can be achieved with minimal disruption to the building’s operation and occupancy. A retrofit offers a unique opportunity to transform the building with a robust, quality and modern façade that integrates with its surroundings, while re-energising and enhancing the ambience for the residents in the area. By recladding the building, property owners can capitalise on the value addition in terms of compliance and visual appeal when leasing or selling properties.